There are a lot of things you could do on a cold, mid-winter Saturday morning. Going to the zoo is one of them. Aren’t they just too cute? 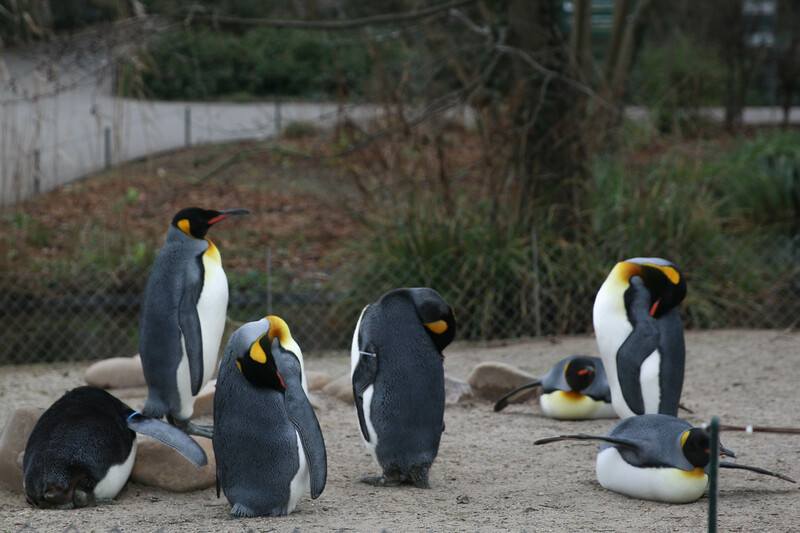 Every morning in winter, at around 11am, the penguins in the Basel Zoo are let out of the Vivarium and allowed to walk through the zoo. I’ve always wanted to see this, but never got around to it. I was determined not to miss it again this year. Wrote it down in my planner and everything. The penguin walk is pretty popular, especially with the kids. At 10:50 people were already waiting outside the Vivarium, waiting for the penguins to emerge. Some of the more eager kids went all the way into the Vivarium itself, anxiously trying to catch a first glimpse of the tuxedo-ed birds. At the appointed time, the penguins emerged and started waddling along the path with the swag of a seasoned celebrity. They weren’t camera shy, for sure. They waddled along with their wings up behind them, stopping every few metres or so to pose for photographs. They loved the attention, and were soaking it up like a cat lying in the sun. After taking about a gazillion photos of penguins, we decided to explore the rest of the zoo. Our final stop was the Monkeys and Apes enclosure, which I personally found fascinating. When we got to the chimps however, there was a certain gravity which I couldn’t quite comprehend at first. People were talking in hushed tones, and were observing the chimps solemnly. The chimps themselves seemed in no mood to play. It was almost as if they were depressed, or even grieving. I observed the chimps and tried to figure out what was going on. What happened? I thought to myself. Was one of them ill? After a few minutes, I spotted one of the chimps walking through the archway that led from one enclosure to the other. He was carrying a baby in his hands. The baby’s eyes were closed; his head and limbs dangled limply. He was dead. The adult chimp carried him up to a group of other chimps sitting up on the benches, and placed the lifeless baby in front of them. One of the group was presumably the mother of the dead baby chimp, and the others had gathered around to console her. It turns out that the baby had died in early January, from unknown causes, and the zoo keepers were allowing the mother to process the loss before she was ready to hand over the body to them. It was a very poignant and solemn scene to watch. For the most part, I refrained from taking photographs, out of respect for the grieving chimps. In the end, however, I sneaked in a few shots. I wanted to remind myself that animals have emotions too, and that they treat the members of their community with a certain degree of respect and decorum that would put some of us humans to shame. It was a sombre end to our zoo visit. As we walked out, however, we saw the penguins once again, taking a well deserved break from the publicity stunt a few hours earlier. There are indeed a lot of things you could do on a cold, mid-winter Saturday morning. But I would definitely recommend going to the zoo. This entry was posted in Blog, Switzerland and tagged animals, Basel, Basel Zoo, photography, Switzerland. Bookmark the permalink. Thank you for the explanation. I was at the zoo today, and saw the chimpanzees. I did not see the notice, but I did see the rag doll baby. I didn’t want to look at it because it was disturbing, but I couldn’t look away because I was really hoping that I was misinterpreting the situation and that the lifeless form was going to start moving. The images are still haunting me.